An updatable and lockable flip chart holder that can clip into the rail strip or channel of a shelf or fasten to a display at a retail store. The flip chart holder allows manufacturers or promoters of products that are sold at retail to create consumer, educational, or promotional flip charts that can easily and economically be updated by opening rings. The lockable flip chart has a panel, and attached to the panel is a ring system with each ring having two ring halves and hinged leaves connected to each other and attached to each ring half respectively. A locking mechanism on the ring system presses against the leaves to prevent the ring halves from opening. Locking the rings also provides security so consumers cannot take the pages out of the flip chart holder. 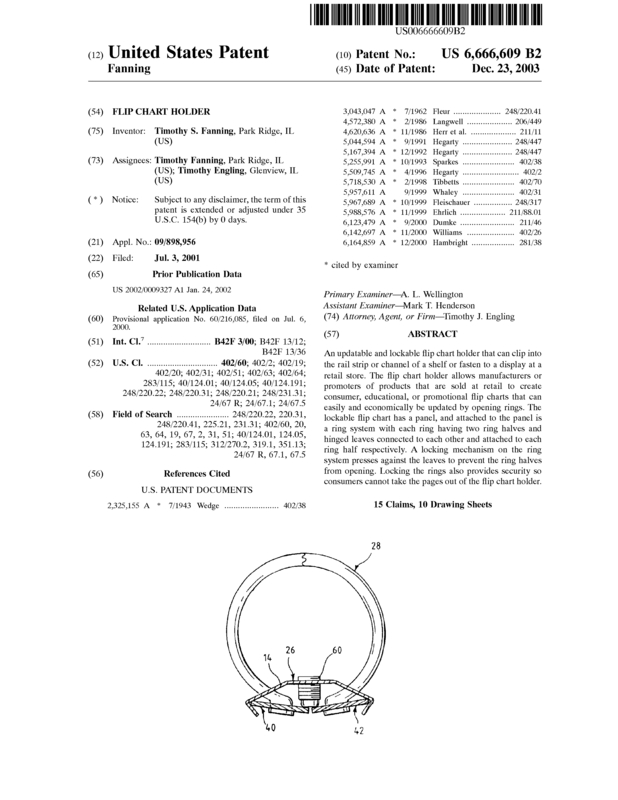 U.S. Patent 6,666,609 is a specific use of broader patent 7,300,222 that is also listed for sale or license covering a rotatable locking mechanism used with ring systems that open similarly to the rings of a binder. A ring system has rings each having two ring halves and hinged leaves connected to each other and attached to each ring half respectively. The locking mechanism on the ring system presses against the leaves to prevent the ring halves from opening. A lock for the rings can comprise an Allen screw or a similar rotatable device located at the cover over the hinged leaves of a binder or a flip chart holder. Ideally, the device has a lip or similar raised area so it is not removable from an aperture in the cover of a binder or a lockable flip chart holder. Locking the rings provides security so users cannot take pages out of a binder or a flip chart holder. Page created at 2019-04-21 16:13:50, Patent Auction Time.